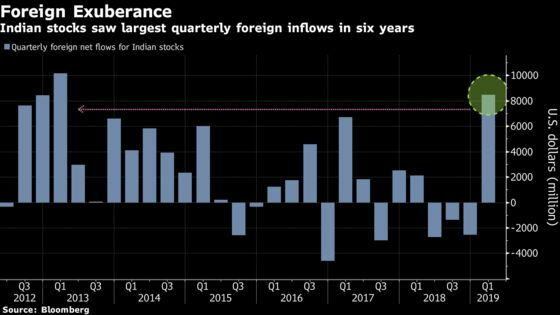 (Bloomberg) -- The biggest quarterly foreign inflow in six years. About $370 billion in value gained. And now, India’s stock market just hit a record high -- its first in seven months. 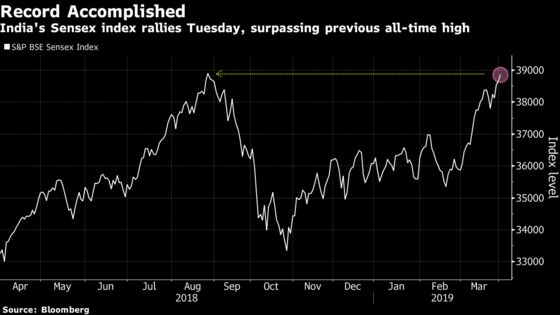 The equity benchmark index for the world’s second-largest emerging market rose 0.5 percent Tuesday, closing above the 38,896.63 level that was required to make the milestone official. India is the first among markets valued at more than a $1 trillion to hit a peak this year. After languishing in their worst run of losses in almost eight years, Indian equities posted the world’s biggest rally in the last month. Worries over rising oil prices, election uncertainty and tensions over Kashmir have faded. Instead, expectations that Prime Minister Narendra Modi will get re-elected, bets that company profits will recover and a dovish shift in central-bank policy in both the U.S. and India have made investors turn positive. The icing on the cake was bullish views from strategists at foreign research firms. Last week, BNP Paribas SA analyst Manishi Raychaudhuri upgraded Indian stocks to overweight, citing stability in corporate-profit growth and indicating that banks’ asset-quality problems are now seen as “a thing of the past.” This came after Goldman Sachs Group Inc. said that stocks will rally in the lead-up to the vote and raised equities to the equivalent of a buy rating. 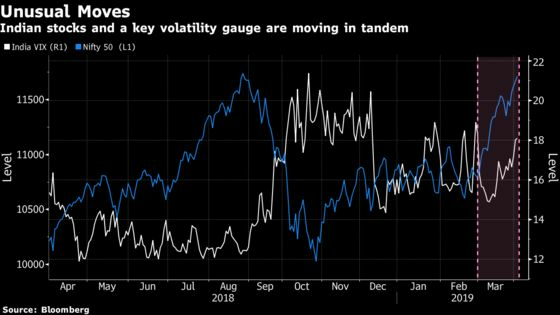 There are certainly more events for investors to either buy or sell India stocks for the rest of the year: Results from India’s general elections next month, hints on where corporate profits will go, U.S.-China trade talks and big moves in oil prices. “The first event is the largest democratic elections globally and in that sense, investors will be looking forward to the formation of a stable government,” said Chockalingam Narayanan, head of equity research at BNP Paribas Asset Management Co. in Mumbai.